The Greek alphabet is composed of beautiful letters that have stood the test of time. There are many sites that can help you learn the alphabet. Many of them have audio features so you can learn how to write and pronounce the alphabet. Bear in mind that there are a number of pronunciation systems. See our pronunciation page for a deeper explanation, history, and examples of the various pronunciation systems. This is the IBG page that provides a historical overview of the various pronunciation systems of biblical Greek. You can click on the letters to hear how they sound in each of the different systems. This page has categorized YouTube videos of recorded Greek alphabet songs into the various pronunciation systems. This page has a good multimedia presentation of the Greek alphabet using a hellenistic or historically accurate biblical Greek pronunciation system. This video demonstrates how to write and pronounce the Greek alphabet using a modern pronunciation system. It is showing it’s age having been produced prior to the advent of YouTube. Jonathan Robie has a great description of the Greek alphabet, mnemonics for learning the order of the alphabet and descriptions of pronunciation conventions. He also has audio helps for pronunciations. This has a great presentation of historical ways to write Greek letters numbers. It also includes modern Greek audio aids. Harry Foundalis has provided a multimedia alphabet page with his ethnic pronunciations. He argues that classical Greek pronunciation was very similar to modern Greek pronunciation. This page has a nice chart showing how the Greek alphabet was originally written in different areas of Greece. To bad it has annoying advertising on it. The current trend of most biblical Greek grammars is to disregard accenting altogether. So it isn’t surprising that there are not many web pages devoted to teaching the rules for accentuation. Here are four videos that explain how to accent Greek words. This site has a brief history of the development of the Greek accent and then a tutorial (in the sidebar) that teaches how to accent Ancient Greek. This site also has practice exercises. This site has a nice presentation of the original pitch system in Greek. This has a very nice summary of definitions and issues surrounding ancient Greek accenting. This site has seven lessons that teach the principles for accenting. This is a PDF document that summarizes accenting rules. There are many sites and programs that offer tools and techniques for learning Greek vocabulary. 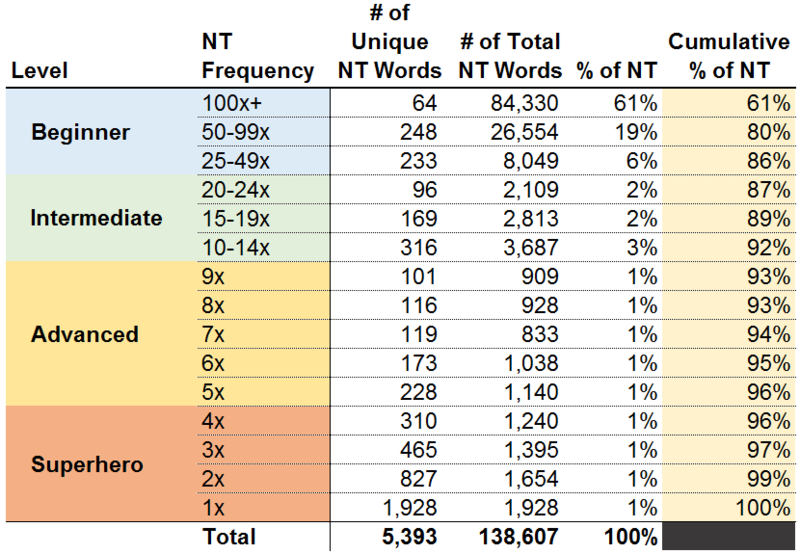 The Renewing Truth Blog put together a nice chart showing the benefit of learning NT vocabulary by frequency. Learning words that occur 100 times or more meaning that you know 61% of the words that occur in the NT. I agree with level break he provides. Here is free ordered list of all words occurring over 100 times in the New Testament. This is a free program that can use any list of words (like the frequency list above). There are many vocabulary lists from most grammars already made for the program. You can create frequency lists for any text in Perseus. Also Smyth has a nice list of verbs with their principal parts arranged in alphabetical order. Here is a nice quick reference for all of those number words. Modern Greek Aids provide ideas for new biblical Greek resources and help with words that don’t occur in ancient literature. There are three declensions in Greek. Declensions are basically the spelling patterns for stem and case endings. Greek has A-stem noun and adjectives (1st declension), O-stem noun and adjectives (2nd declension), and consonant stems (3rd declension). This link provides a PDF download of grammatical information as well as delightful exercises for study. Peurifoy has nice charts with general spelling rules for the 1st & 2nd declensions. The PDF file has a nice summary of adjective syntax rules. 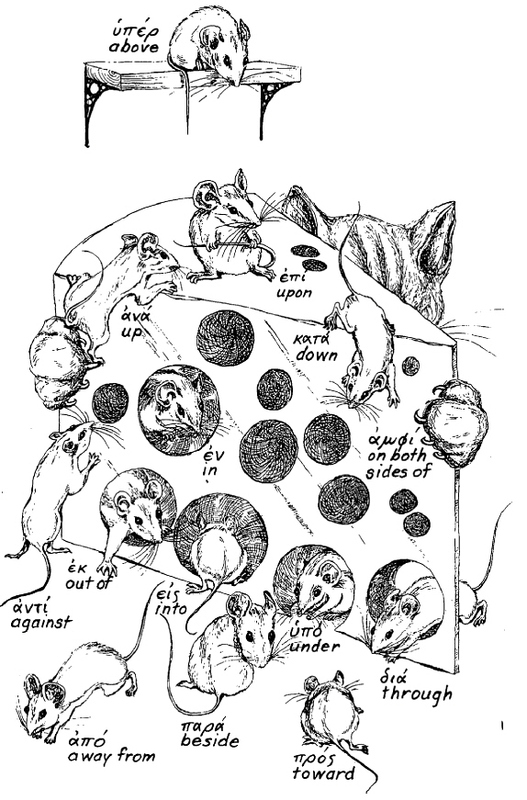 This is an exhaustive list of noun paradigms grouped by noun stems. This is a very helpful way to learn noun morphology. This is a complete list of adjective paradigms arranged by stems and endings. Jonathan Robie has a nice description of personal pronouns with audio capabilities on this page. The lesson on pronouns may be found here. He has a number of helpful examples following the chart. He has a nice list of NT examples of further uses of αὐτός. This is a great summary of demonstrative pronoun syntax and forms. He also has a nice list of relative pronoun examples. This sheet has all of the pronouns in one place. This is a complete list of pronouns and how they decline. 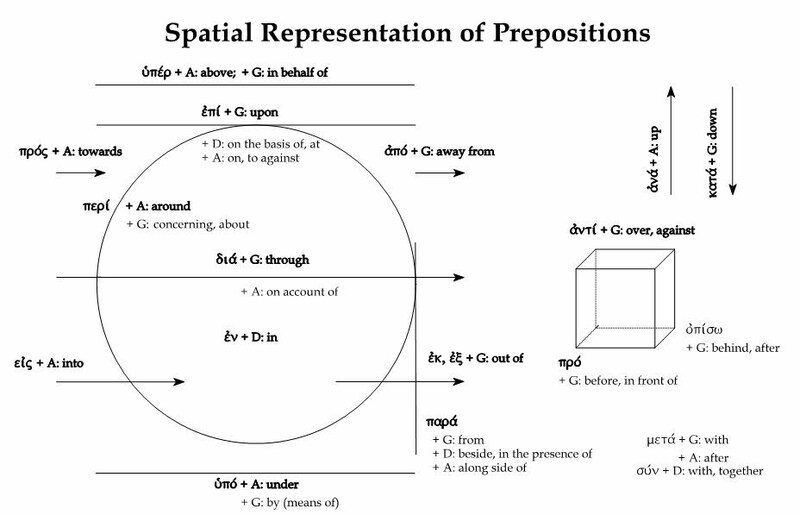 Prepositions show the relationships between a noun (the object of the preposition) an another noun or verb. Thus they serve the same function as case endings. 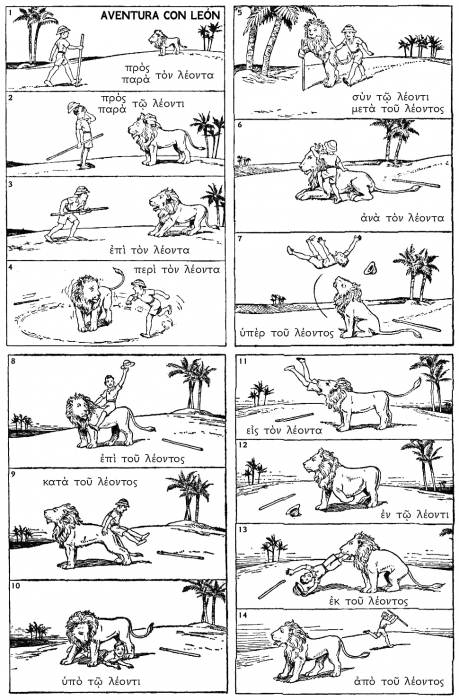 Check out these great cartoons for learning Greek prepositions. Click the link above to download a PDF of the lion cartoon. There are a number of ways to consider the Greek verb. Morphology is the study of spelling and syntax refers to how verbs are used in context. If you are interested in morphology please check out the IBG unicode verb chart. You can cut and paste from it to suite your needs. This site has hand-outs Helma Dik made for her Greek classes, in PDF format. Most fit (in landscape format) on a single (US letter) page. This is an exhaustive list of verb paradigms grouped by verb stems. This is a very helpful way to learn verb morphology. Peurifoy has a description of verb tense forms which includes forms and rules for spelling changes. This site has a nice drilling program for learning principal parts. They also have an online verb quizzing page. This page has a good presentation of different aorist stem forms. The distinction between simple, general and contrary-to-fact conditions can be very confusing. Although, this page presents these categories using 1st class, 2nd class, etc., designations, it is comprehensive and links to a nice PDF chart for a summary. This chart is a very nice summary with descriptive categories. This is a PDF with a nice list of ways participles may modify verbs. I would like to see this list divided into pre-verb positions and post-verb positions. Here is another treatment of issues surrounding verbal aspect. For decades the discussion of verbal aspect was framed by Porter’s work on the subject often in contrast to Fanning and McKay. In 2009 Dr. Steven Runge reviewed the references that Porter cited in support of his argument and found some shocking internal difficulties for Porter’s system. This is the link to Runge’s SBL paper. Runge also has some follow up comments. Often students discover that better understanding of English grammar is necessary to learn a foreign language like biblical Greek. A nice PDF doc explaining many grammatical terms. This is a single page PDF explaining grammatical terms necessary for learning Greek. This is basically a free short book (48 pages) that explains concepts of English grammar. There are a number of other Greek grammar gateway sites out there that provide links to learning resources for all parts of the Greek languages. Many of these sites have an entire in-house presentation or Greek curriculum. Rod Decker developed this site with many helpful links. This valuable site by Dr. Mark Goodarce has great links and good summaries of the available resources. This is the site of Michael Palmer, whom I have had the pleasure to meet. Mr. Palmer is obviously dedicated to Greek education and has collected a number of very good links to equip others toward that end. This is Dr. J.W. Robert’s primer for learning Biblical Greek. It is divided into chapters with exercises for the various elements of grammar. All of the exercises are translating from Greek to English and it is squarely a course that teaches about Greek (grammar) rather than a course for fluency. The grammatical categories are the current way of carving up grammar and one that I find atomistic. It is a strong grammar for accomplishing its goals. Peurifoy has a huge list of handouts that will take a person through the process of learning Greek. This is comprehensive gateway site with links to all sorts of trusted biblical Greek resources. This site has an entire program that will teach someone Greek. This is an old style framed website that covers the basic areas of Greek grammar. It is distinct from NTGreek.net. This is an entire video course that follow’s Black’s textbook. This section contains examples and presentations for different ways to begin learning biblical Greek. This page has a number of recommendations and links for planning out your way to learn biblical Greek. This page lists ten different approaches to language acquisition and time each method was promoted within education. This approach seeks to teach students to interact with original texts using language tools rather than expecting students to learn to read the language without aids. This is a short article with links defending this traditional approach. This approach seeks to teach students to think in the foreign language rather force students to translate prior to understanding. It normally makes use of methods such as TPR and TPRS (below). This link talks about the TPRS method being used in K-12 applications but the principles can be applied to learning biblical Greek. This is a general article explaining the role of TPR in learning. Please take a look at the provided video examples provided on the right to see TPR in action. This modern Greek example shows how awkward or dramatic pauses can aid learning (Greek language learning meets telenovela). Learning a foreign language takes a lot of time and dedication. Why would someone want to learn a dead language like biblical Greek when the texts have already been translated? Rod Decker explains his rationale for the importance of learning biblical Greek. by Dr. William D. Ramey, the instructor at InTheBeginning.org. He has a brief introduction on this page giving reasons why ministers should study Greek.